Second in a new series of Philadelphia Klezmer Jams. Play some tunes with our house band, perform in the cabaret, or do some dancing! Presented by Susan Watts and the Community Klezmer Initiative. We'll be jamming from 7-9 pm at the Workmen's Circle. 1762 Beacon Street Brookline, MA 02445 Keyboardists should bring their own boards. Featuring Dave Rosenfeld (on mandolin, violin, percussion) and Mike Perlmutter (on clarinet). Savory sounds go well with sumptuous meals. Invite your friends and family to enjoy live Klezmer. Saul's can accommodate large parties. Call 510-848-DELI to make a reservation for parties of 5 and more and ask for prime seating near the musicians! Chat up Mike and Dave - they love discussing the history, culture, and distinctiveness of Klezmer. Thanks for supporting your local Klezmorim! Common Chords—the multifaith ensemble led by Salman Ahmad (Junoon) and Yale Strom (Hot Pstromi), with internationally acclaimed musicians Elizabeth Schwartz (vocals), Samir Chatterjee (tabla), Mark Dresser (bass), Sunny Jain (percussion), Tripp Sprague (reeds) and Lou Fanucchi (accordion)—headlines the San Diego Jewish Arts Festival this year. Common Chords brings their intense, high energy musical collaboration of klezmer, jazz, bhangra and Sufi rock to the Lyceum Stage at the San Diego Rep, 79 Horton Plaza, San Diego, CA 92101. $18. For reservations: (619) 544-1000 or www.sdrep.org. For more information about Common Chords: www.CommonChordsMusic.com. End of season dinner and concert with guest artists guest artists Cantor Robert Abelson,Cantor Janet Leuchter & Cantor Ben Matus. Wednesday, June 6, 7:30 p.m., Hevreh of Southern Berkshire, 270 State Road, Great Barrington. Chamber music concert showcasing works by Jewish composers. Tickets, $12, available for purchase at the door. On Wednesday, June 6 at 7:30 p.m. at Hevreh of Southern Berkshire in Great Barrington, the Celebration will present a concert of chamber music showcasing important chamber music by Jewish composers. The concert will include the exciting Sonatina for Clarinet and Piano by Paul Schoenfield; the lush, romantic Trio by 19th century Russian-Jewish composer Alexander Zemlinsky; the Suite Hebraique for Violin and Piano by Ernst Bloch; and a special work, "Assimilations" by Robert Sirota, which explores the composer's Jewish roots in the face of his conversion to Christianity. Cantor Robert Scherr will be featured in the New England premier of "Yishakeni" by Meira Warshaw, for tenor flute and piano, based on The Song of Songs. Performers are Paul Green, clarinetist; Robert Scherr, cantor and Jewish Chaplain for Williams College; Doris Stevenson, pianist and Williams College faculty member; Joel Pitchon, violinist and Smith College faculty member; Ronald Feldman, cellist and Williams College faculty member. Tickets are $12 and will be available for purchase at the door. Jazz Rabbi Invitational: Gary Lucas plays "The Golem"
8:30 PM Gary Lucas plays "The Golem"
Since debuting this score live in 1989 with co-composer/keyboardist Walter Horn at the BAM Next Wave Festival, Gary has gone on to accompany the film with a solo guitar version of his score in over 16 countries around the world—performing the work at London's Royal Festival Hall, opening the New York Jewish Film Festival at Lincoln Center, starring at the Venice Biennale, opening the Australian Jewish Film Festival in Sydney and Melbourne, playing with the film in Moscow, St. Petersburg, Amsterdam, Berlin, Florence, Budapest, Toronto, St. Louis, Miami, Tel Aviv, Vienna, Krakow—and of course in Prague, home of The Golem. Ovadya is playing the Greater Chicago Jewish Festival. A short but powerful set - not your father's pirkei-chazzanut! For more info, see www.ovadya.net and www.jewishfestival.org. The informal jam sessions on the second Sunday of each month are back by popular demand! Bring an instrument and a tune to share, or just come along to listen. The pub serves food and there is plenty of room to chat and schmooze! Supported by the Jewish Music Institute. 7:30 pm. Tickets are $15.00. On Tuesday, June 12 at 7:30 p.m. at Temple Anshe Amunim in Pittsfield. Paul Green and some of the Berkshires‚ best Klezmer musicians will perform traditional tunes from the Eastern European Klezmer repertoire, the Sephardic repertoire and the Second Avenue Jewish music scene in New York. Tickets are $12 and will be available for purchase at the door. More info: www.radyjcc.com or call 477-7510. As a spectacular finale to the 2012 Festival, Mameloshen will bring to life excerpts from Fiddler on the Roof in Yiddish. After several years of planning and discussion, the stories of Sholem Aleichem that went on to become one of the most successful Broadway musicals ever, will come to life in Yiddish. Fiddler On The Roof has been done in Japanese, Hebrew and perhaps Spanish, but this is the first time in Western Canada (perhaps even the first time in Canada) that will be performed in Yiddish. The show with its all-Winnipeg cast will feature excerpts from the musical. Local talent for Fiddler on the Roof include Jill Brandes, Miriam Bronstein, Doreen Brownstone, Jerry Cohen, Shayla Fink, Debbie Maslowsky, Mal Magorel Justin Odwak, Bonnie Robinson and Perry Rubenfeld. Under the leadership of producer Kinsey Posen, a full artistic team is being assembled. Lyrics will be projected on a screen in English to allow everyone to enjoy this amazing venture into musical theatre. Abe Lebewohl Park lunchtime series! After many years of singing lush Ladino melodies, Ljuba Davis finally preserves her music in a timeless album, East and West (6/12/12). The Ljuba Davis Ladino Ensemble present their songs with little tugs of musical dominance, which differs from what most would envision as the typical Judaeo-Spanish style. Led by bouzuki master, Avram Pengas, Davis' ensemble is made up of some of New York’s top Greek, Arab, and Jewish musicians. Their lush Middle-Eastern melodies beautifully compliment Davis' joyous, yet dynamic, voice with an acoustic richness. They will be performing at DROM in New York City on June 15th, 8pm. Entry: £3 added to your bill. Enjoy the LKQ and reasonably priced Turkish food at this friendly local restaurant. Every Sunday Morning, combining live music and food in a fresh, cultural environment, City Winery’s Klezmer brunch series pairs some of the greatest musicians in the world with delicious lox, bagels and other tasty fare on Sunday mornings from 11am to 2pm. City Winery's brunch on June 17, 2012 will feature Kabbalah. Sunday, June 17, 3:00 p.m., Congregation Beth Israel, 53 Lois Street, North Adams. 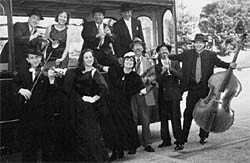 Klezmer concert. Tickets, $12, available for purchase at the door. 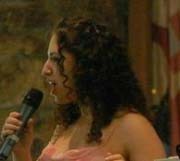 **Performing Yiddish songs from Heather's newly released CD “Shifreles Portret. She will also sing duets with special guest artist Miryem-Khaye Seigel.The program will include both known and lesser-known Yiddish theater songs. Four-day Festival passes are $12 in advance, $15 at the Festival. Day-passes, $5. An evening of traditional, unaccompanied Yiddish song, featuring Michael Alpert, Benjy Fox-Rosen, Carol Freeman, Sarah Gordon, Beyle Schaechter-Gottesman, Esther Gottesman, Itzik Gottesman, Gerald Marcus, Miryem- Khaye Seigel, Paula Teitelbaum and Joshua Waletzky. KlezBiGay Pride Show: 14th annual celebration! KlezBiGay Pride 2012 returns to beautiful El Sol Brillante Community Garden on East 12th St between Avenue’s A & B, in the heart of NYC's East Villaeg (with rain location at The JCC in Manhattan, 334 Amsterdam Ave @ W. 76th St). Our theme this year is Equality Anniversary Mazel Tov. 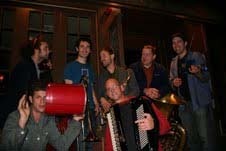 Full Isle of Klezbos sextet! More details to come. This performance is made possible in part with public funds from the Manhattan Community Arts Fund, supported by the New York City Department of Cultural Affairs in partnership with the City Council; and with public funds from the Fund for Creative Communities, supported by New York State Council on the Arts. We thank the Lower Manhattan Cultural Council which administers both these funds, and our fiscal sponsor, Jews for Racial & Economic Justice. FREE & open to the public, all welcome!